A fastigiate form of the common beech, this tree offers red foliage in the spring that turns a beautiful deep purple in the summer and then brown in the autumn. 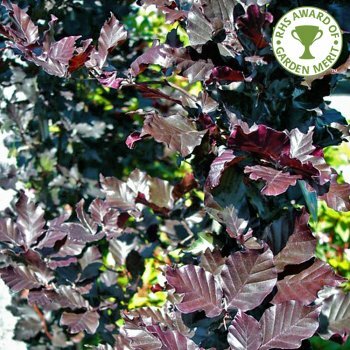 Fagus sylvatica 'Dawyck Purple' is a beautiful neatly shaped slender tree that grows to just 10 x 3 metres in 20 years, making it ideal for many gardens, whether as a focal point or for a formal avenue. 'Dawyck Purple' is named after the Dawyck Botanic Garden, although is more commonly known as Purple Fastigiate. This purple upright beech tree will tolerate most soils and exposed conditions, but avoid wet positions. Plant in full sun for the very best colour. For a golden leaved form see Fagus sylvatica ‘Dawyck Gold’ or view all Beech trees. When planting beech trees, such as Fagus Sylvatica Dawyck Purple, it is important to prepare the planting area well. Pot grown beech trees can be planted at any time of the year. You will need to carry out the following to prepare your planting site.